Congress, which has copied its bloopers filled #KnowYourLegacy campaign from BJP’s #KnowYourGovt campaign, is time and again trolled on Twitter by users who remind Congress of the horrors inflicted by Congress leaders on Indians. The audacity Congress has in equating Nehru-Gandhi dynasty’s history to history of India is unfathomable. They are so blinded in the love for The Dynasty that they believe every other thing in India has been and named in honour of The Family. Doesn’t quite come as a surprise that all three prime ministers from The Dynasty got a Bharat Ratna, of which Nehru recommended himself for the highest civilian award and while it is unclear who recommended Indira for the award, chances are she too recommended herself for the award. The Family has been so self obsessed that they have covered the length and breadth of the country naming every other road, airport, educational institute, locality, metro station after them. But in the mad rush for naming things after them, Congress social media team forgot that not everything that is named Indira in India is named after Indira Gandhi. Yesterday, Congress Twitter account ran a quiz asking which northern most point in India is named after Indira Gandhi. Most people answered Indira Point in Andaman and Nicobar Islands, which is the southern most point in India (not norther most as in the quiz), named after Indira Gandhi, the then Prime Minister of India, by a local MP. A Twitter user took a jibe on Congress and said how they need to #LearnYourHistory to understand that not everything in India is named after The Family, thankfully. 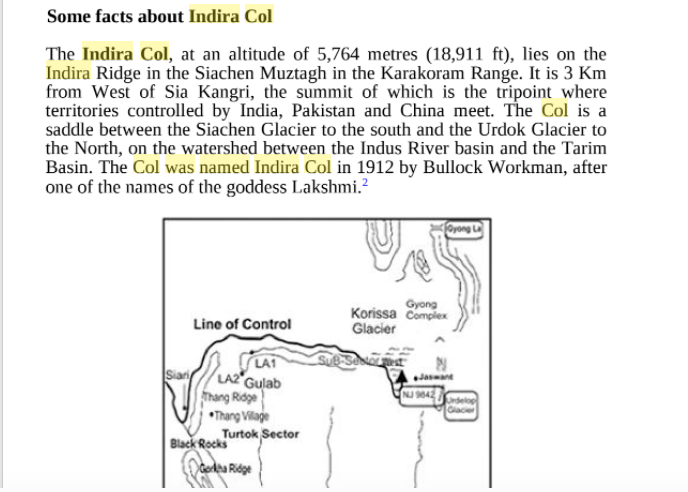 The northern most point in India is named Indira Col, but it is not named after Indira Gandhi. It was named in 1912, 5 years before Indira Gandhi was born in 1917. Perhaps Congress should hire a fact checker before posting lies and glorifying The Family.